Good to have had Ezri Snowball from PatPlus, with us doing Portable Appliance Testing at our Sheds as we previously reported. 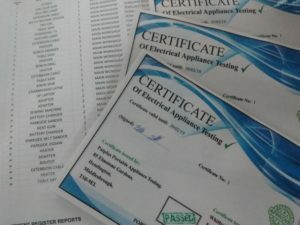 Now we have the certificates to display with a list of all the kit tested – 97 items in all. 38 at Eskmouth Hall, 43 at SAMS (main) Place and 16 at the annex otherwise known as Dave’s Domain. One item failed. It was the most portable of appliances, a cable. Problems often occur not in equipment but in the leads into plugs. Keep an eye for this even on molded plugs often fitted to new appliances these days. We are very pleased that the donated second hand items all passed the test.